Sony's latest flagship phones are like no other devices out there -- and there's a decent chance one of them might be just what you've been looking for. As a Guy Who Reviews Tons of Android Devices (my official job title), I see a lot of forgettable phones. Phones that are fine but unremarkable -- that get the job done but fail to stand out or make any sort of meaningful lasting impression. I've written about this phenomenon before. It's part of something I like to call the "So what?" era of Android phones -- the idea that specs alone are no longer enough and that a phone needs something special in order to make an impact. Some of the most prominent Android devices fail to achieve that and rely mainly on marketing and brand recognition for success. 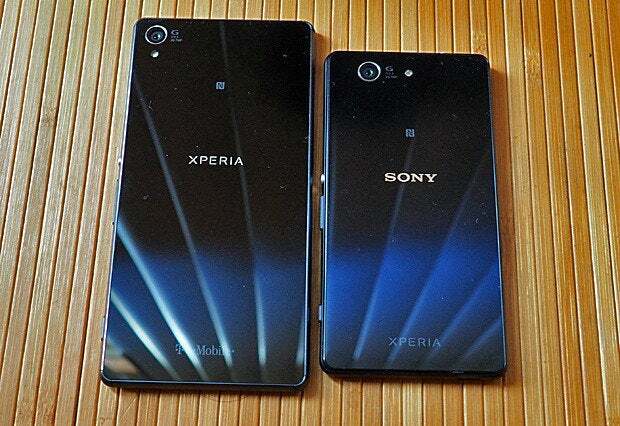 Sony's smartphones are different. They're distinctive, they're memorable, and they're enjoyable to use. They're by no means perfect, of course, but believe you me: They get a lot of things right. I recently spent some time living with Sony's Verizon-only Xperia Z3v and came away pleasantly surprised. 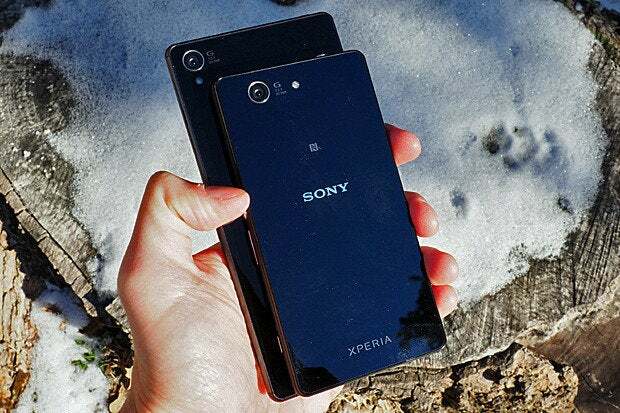 The Z3v is a tweaked version of Sony's universal flagship, the Xperia Z3, so I've been living with that phone for the past several days to form a comparison. I've also been spending some time with the Xperia Z3 Compact, which is a sized-down version of the Z3 (got all that?!). The Xperia Z3 is available from T-Mobile in the U.S. for $0 down and a two-year payment plan of $26.25 per month. You can also buy it unlocked directly from Sony for $630. The Z3 Compact, meanwhile, is available only directly from Sony here in the States; it'll run you $530 unlocked from the company's online store and should work with either AT&T or T-Mobile. Let's start with the Z3, because that's easy: It's more or less the same exact phone as the Z3v, only in a thinner and rounder form that feels smaller and more comfortable to hold. The Z3 sheds the Verizon version's sharp angles and goes with a softer approach that makes it less industrial and more approachable. In short, it's the same device in a better body. Oh yeah: And it doesn't have giant Verizon logos plastered in every possible place. 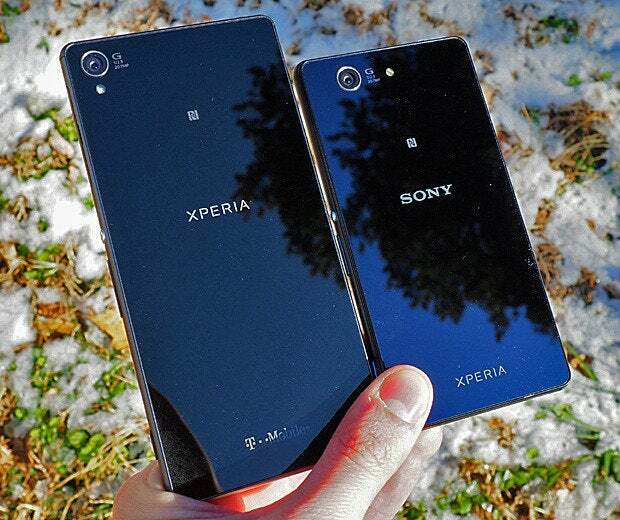 The Z3 Compact, meanwhile, is basically just a smaller version of the Z3 -- same look, same style, same design. And it's seriously small by current smartphone standards, which is something I think a lot of people will appreciate. For perspective, the regular Z3 is 5.7 x 2.8 x 0.29 in. ; the Z3 Compact is 5.0 x 2.6 x 0.34 in. That's close to the same size as the original Moto X (actually a hair smaller). It's easy to hold and carry -- not quite as ergonomic as the Moto X, with its warmer materials and gently curved form, but still the right size to fit comfortably into your hand and pocket. It's really a refreshing change from the increasingly bulky devices that are becoming the norm. The tradeoff, of course, is screen space: The Z3 Compact has a 4.6-in. display while the Z3 has a more typical 5.2-in. screen. The Compact's screen has 720p resolution; the regular Z3 sits at 1080p. The spec-obsessed crowd might turn its collective nose up at those numbers, but the truth is that both resolutions are perfectly appropriate for the screen sizes -- and in real-world terms, both displays look quite good. The Z3 is by no means big, incidentally -- certainly nowhere near the size of a plus-sized phone like the Nexus 6 or Note 4. It's pretty normal based on today's smartphone standards. The Z3 Compact is just small based on those same standards, much like the original Moto X was when it made its way into our lives last year. 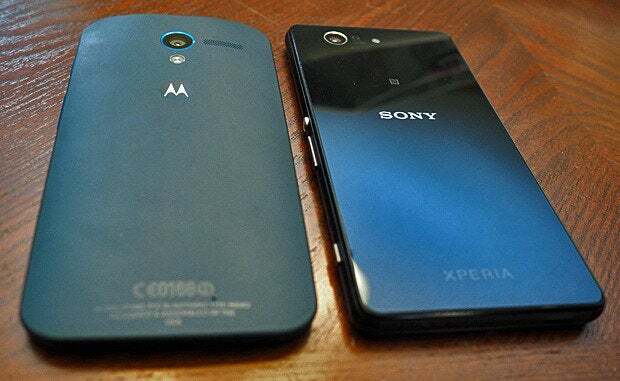 What's noteworthy, though, is that there's not much other than size that sets the Z3 Compact apart from its bigger brother. The Compact has a translucent soft plastic trim instead of the metal that adorns the Z3, which makes it look a bit less premium -- but it's a subtle difference, and the Compact is still a striking and attractive device. What's more significant is that both phones have the same outstanding build quality, performance, and stamina. Sony describes them as providing "two-day battery life," and depending on your usage patterns, I'd say that's entirely possible: Even with exceptionally heavy use, I've yet to come close to running out of power on either phone within a single day. Both phones have great front-facing stereo speakers and one of the best camera setups I've used on an Android device (see my Z3v analysis for a couple of sample shots; all three phones have essentially the same configuration). The phones' cameras are even capable of taking photos underwater, which is a pretty cool feature to have. The devices themselves are both fully waterproof, in fact; you can keep them under as much as almost five feet of water for half an hour if you're so inclined. The Z3 and Z3 Compact both come with 16GB of internal storage -- less than the Z3v's 32GB -- and an SD card slot for external storage expansion. (If you buy the Z3 from T-Mobile, that specific version of the phone has been upgraded to include 32GB of internal space as well.) That aside, the only important under-the-hood difference between them and the Verizon model is that the Z3v supports wireless charging while these devices do not. That's a bummer, as the waterproof nature of the phones means their charging ports are protected by small flaps you have to pull off every time you want to plug them in -- which is a minor pain in the putoodle. Sony does offer a proprietary charging dock if you feel like ponying up an extra 27 bucks to get around the inconvenience -- not an ideal solution, but it's something. There's not a heck of a lot I can say about the software that I didn't already address in my coverage of the Xperia Z3v, so I'll refer you there for the full nitty-gritty. In short, Sony definitely makes its share of arbitrary changes to the UI that range from mildly annoying to sigh-inducing -- like the abundance of bloat and the way-too-prominent pushing of its own storefronts throughout the OS. But for the most part, it's not too bad. It's really all relative; given the choice between Sony's software or Samsung's or LG's, I'd take Sony's every time. On the plus side, it's worth noting that both the Z3 and Z3 Compact are able to stream and play PlayStation 4 games from a console connected to the same network. If gaming is your thing, that's a valuable perk you won't find anywhere else (outside of the Xperia product line). The regular Z3 has tough competition in its class, particularly considering its limited availability in America, but it's absolutely up there with the best of 'em. If you like its style and appreciate its underwater abilities -- and are okay with the software-related asterisks that accompany those traits -- it's a standout phone I'd eagerly recommend. The Z3 Compact, meanwhile, is going to be even more of a niche product because of its extremely limited U.S. availability; you really have to go out of your way to look for it and then also be willing to pay the full unsubsidized cost, which is something most American consumers still aren't accustomed to doing. If you're willing to jump through those hoops, though, the phone fills a huge void in the Android ecosystem -- that of a small-sized flagship that's every bit as impressive as its larger sibling. The Z3 Compact absolutely nails that -- and if you want a compact device that doesn't compromise, I wouldn't hesitate to pick one up. There's no other current phone that comes close to matching the quality it provides in such a manageable size.